On Fridays I will post my FAB Friday project. This will be fun because it will be a variety of projects I'll share with you and a video how- to to go along with it . 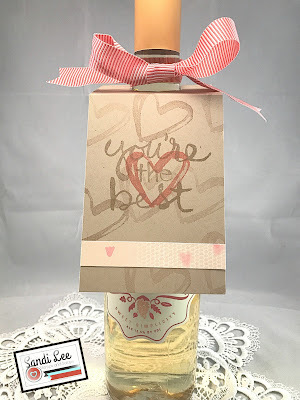 This project came about because I couldn't find a wine gift bag for a gift and I needed it right away! Hope you enjoy it! I just love how quick and simple this tag was to make. You could put it on a water bottle, soda bottle or like I did... a wine bottle! All you need is a piece of 31/8" X 6" piece of crumb cake cardstock and a piece of falling in love designer series paper that is 1/2" by 31/8". On the video below, I made a mistake and said 1/4" instead of 1/2". Stamp it up with something fun! I used watercolor words from the annual Stampin' Up catalog. Use your 13/8" circle punch, score it so the tag will lay nicely on the bottle and you are good to go! Please see my video below for a how-to and complete list of supplies below! If you would like to order use this host code... XKEFD2E3 click here to go to my store. I'll send you a little something something just for ordering from me! Join me again on Monday for Map it for You Monday's! Can't wait for you to see the card I made to go along with the sketches for you...sketch 1! Doing a little giveaway on Facebook. Check out my Sandi Lee Stamps and Scraps Share Page. And enter to win! You have until Sunday at 12PM EST to enter! Map it for You Monday...happy birthday, gorgeous!